To mark the 40th anniversary of the first Fluxus festival in Wiesbaden, Germany, and the 30th anniversary of Fluxshoe which toured England with a series of performances, concerts, and exhibitions (1972–3), On Fluxus will continue the volume theme of ‘textualities, scores and documents’ and focus on the relationship of writing and textuality to Fluxus. Fluxus was an international community of artists, architects, designers, and composers described as ‘the most radical and experimental art movement of the 1960s’. 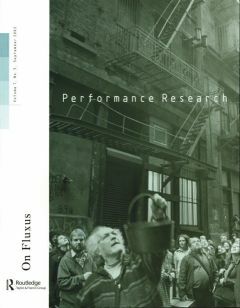 As a laboratory of experimental art, Fluxus was the first locus of intermedia, concept art, events, and video, and a central influence on performance art, arte povera, and mail art. 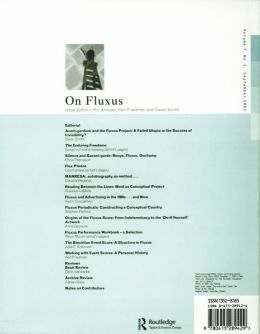 The issue will be guest edited by Ken Friedman, an active participant in Fluxus, as an artist since 1966, as director of Fluxus West for a decade, and as editor of The Fluxus Reader (1997); and Owen Smith, an art historian and curator specializing in intermedia and multimedia art forms, and author of Fluxus: History of an Attitude (1998). Avant-gardism and the Fluxus Project: A failed utopia or the success of invisibility?